faster processor and is now the HC16 Thin Client Terminal. Please click here to be taken to the HC16 Thin Client Terminal page. Designed to support the IBM™ System i5, iSeries, and AS/400 systems, the HC5 feature I-O's award winning 5250 printer emulations and offers an IBM style 122-key 5250 keyboard. The Pro|Edge HC5 Thin Client is based on Windows™ CE Operating System and driven by a AMD Geode GX533 processor. In addition to host applications, the HC5 is ideal when utilizing applications served up by Citrix Presentation Servers or Microsoft Terminal Services. 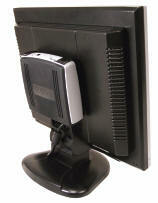 The Windows CE Operating System requires a minimal amount of RAM and Flash making it an economical, powerful solution. About the size of a three CD set, the HC5 is unobtrusive and occupies a small amount of desktop space. Despite its small size, the HC5 offers the scalability of increasing Flash size. I-O has partnered with Altiris® to provide simple configuration, control and management. As a leader in client software management tools, Altiris offers console and web-based control, reporting alerting, policy driven software delivery, patch management, and other Altiris IT lifecycle management solutions. Because CE is a read-only operating system, applications cannot be installed on the HC5. This important feature prevents users from introducing virus, malware and unwanted programs.